Open spaces are great for a number of reasons. In offices they facilitate collaboration and communication, and in homes it keeps things flowing and bright. The only time open concept isn’t great is when you need a little privacy or to define some space. Room dividers to the rescue! Room dividers section off parts of the room creating little micro rooms without fully closing off areas. They also let in light and prevent tiny spaces from feeling dark and gloomy. 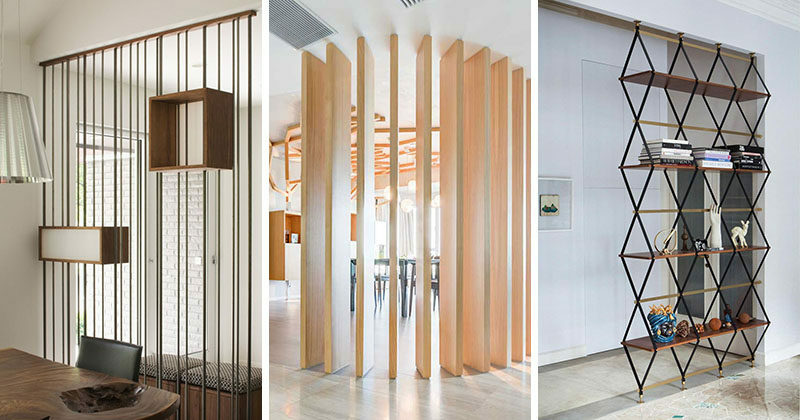 Here are 15 examples of space dividers in a number of different settings and configurations. 1. 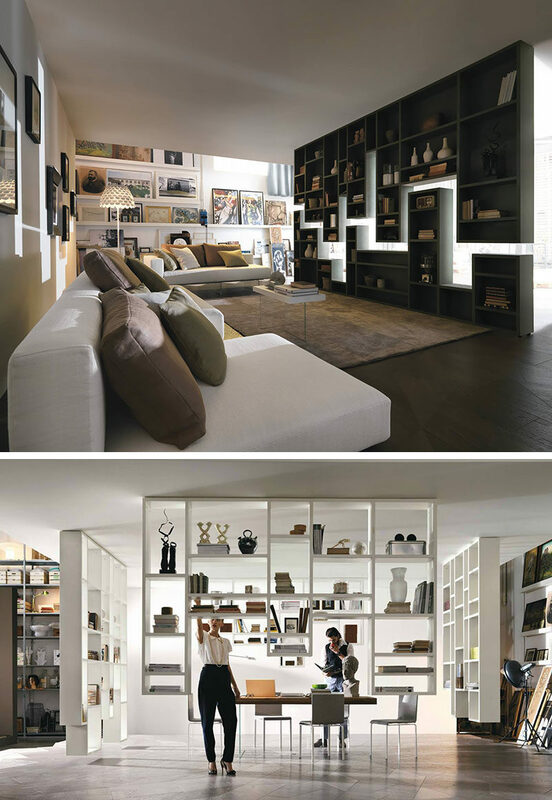 This bookshelf can be configured in whatever way you like and can either be hung or stood between rooms. LagoLinea Shelf designed by Daniele Lago for LAGO. 2. 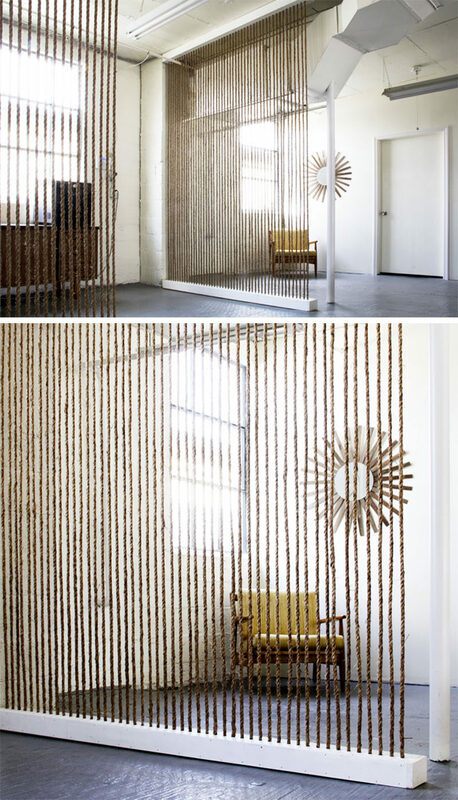 This DIY rope wall is a great way to divide a space without losing light. 3. 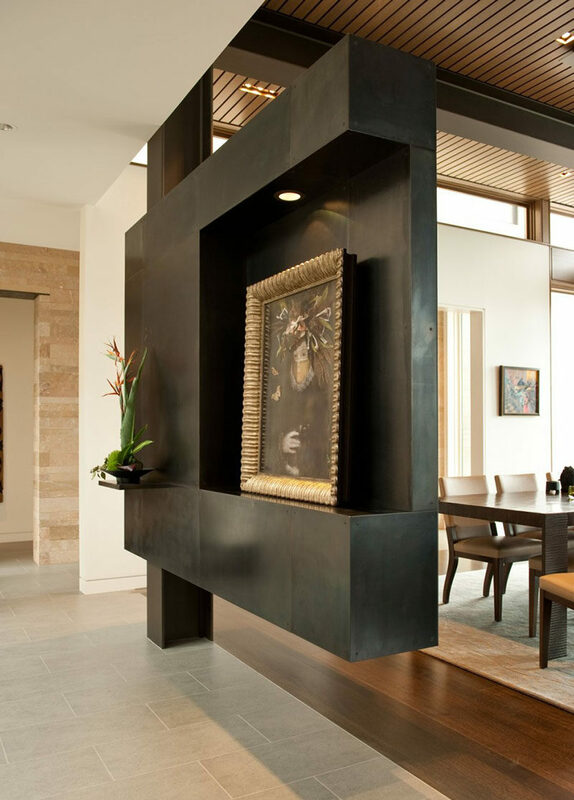 This steel covered room divider makes a strong, bold statement. Designed by Stuart Silk Architects. Photography by Rob Perry Photography. 4. 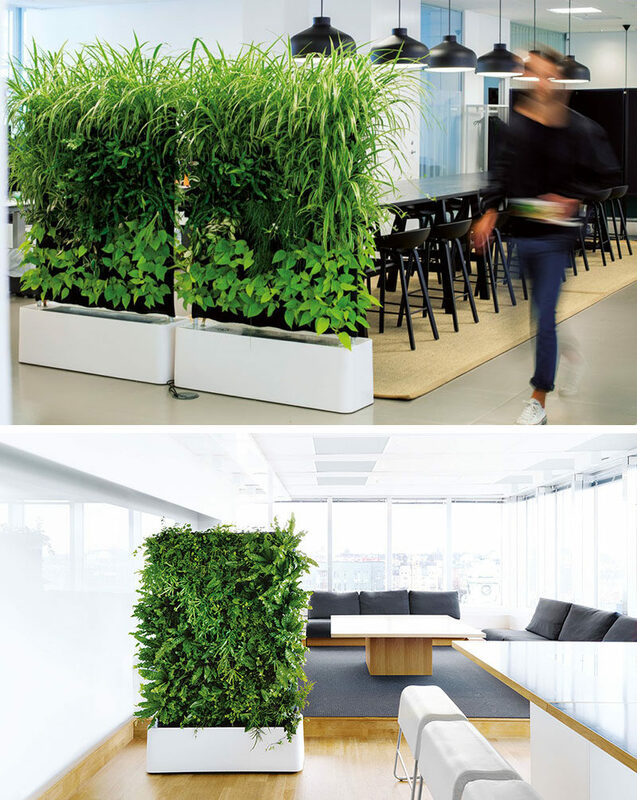 These plant walls are a great way to divide spaces because they offer sound absorption and purify the air. Designed by Per Berglund & Lisa Wacklin for Greenworks. 5. 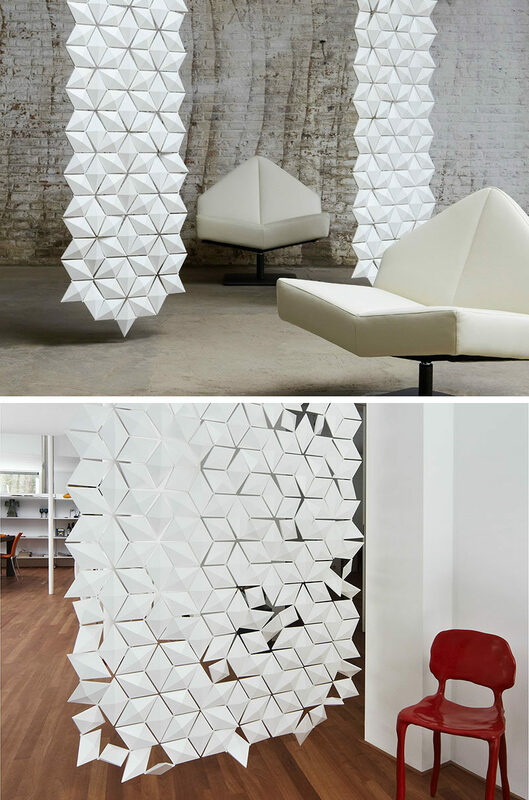 Each of the diamond shapes that make up the panels of this room divider, can be rotated to create patterns using light and shadow. Designed by Bas van Leeuwen & Mireille Meijs and manufactured by blooming. 6. 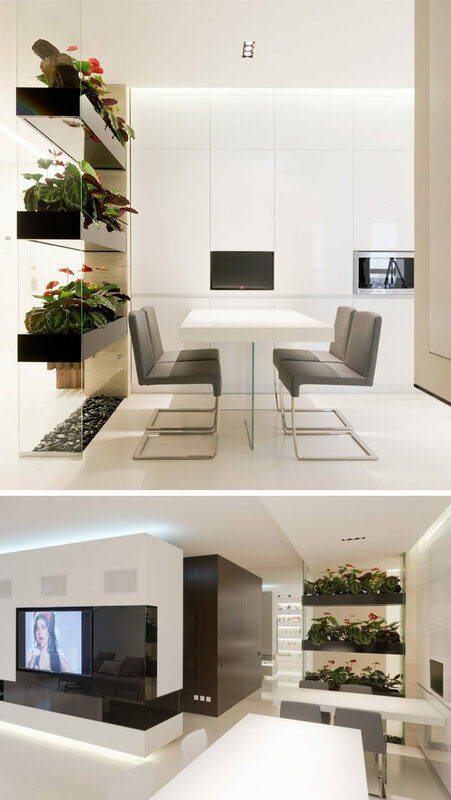 This permanent room divider adds some greenery to the interior. 7. 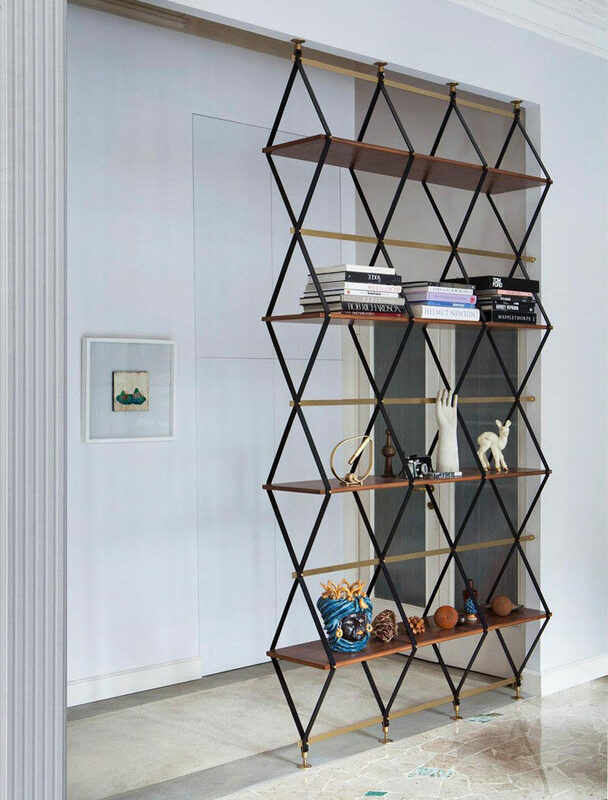 This multi-functional design is both a floor-to-ceiling shelf and a room divider. Designed by Pietro Russo Design Studio. 8. 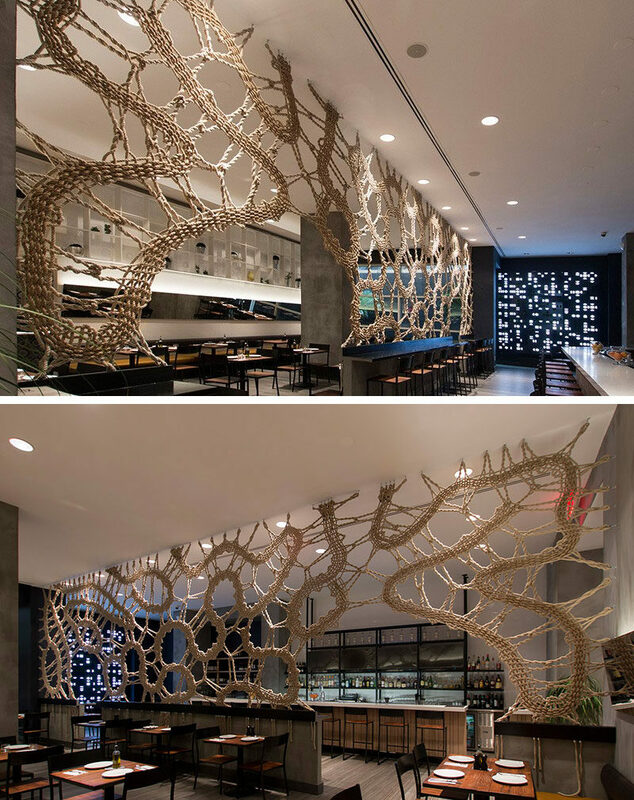 This handmade rope screen divider is also an artistic feature in this restaurant. Interior design by Archipelagos / A2 Interiors Studio. Rope screen and photography by MANTZALIN. 9. 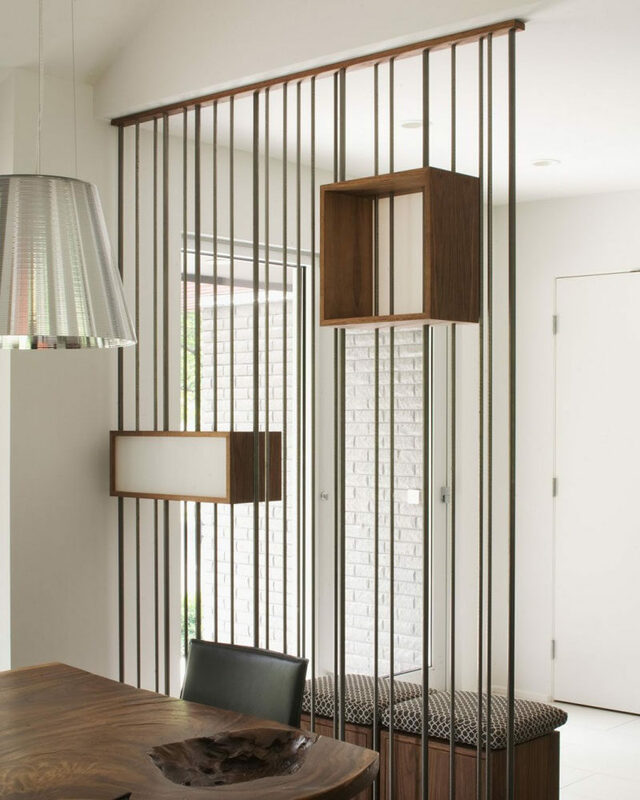 This space divider, made of metal rods and suspended boxes, separates the entrance way from the dining area without making either one feel closed off. Designed by Hufft Projects. Photography by Mike Sinclair. 10. 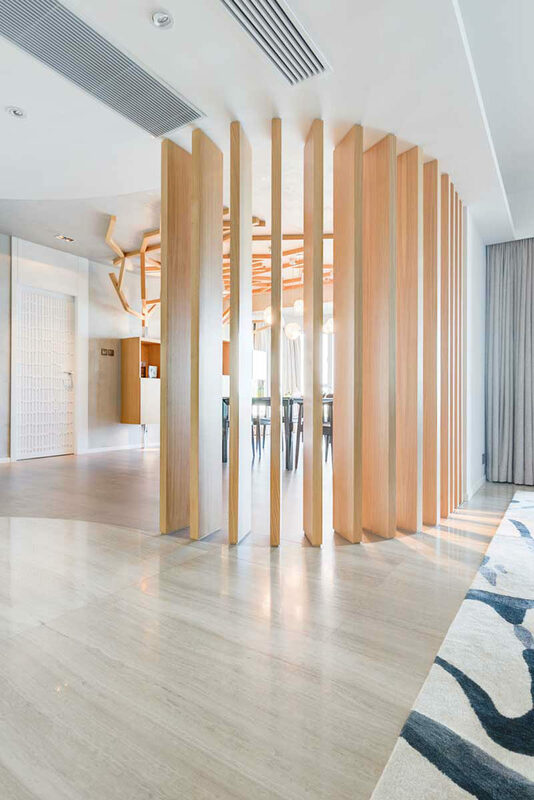 This contemporary apartment has a lot of elements of nature throughout, including the wooden space divider between the dining and living areas. 11. 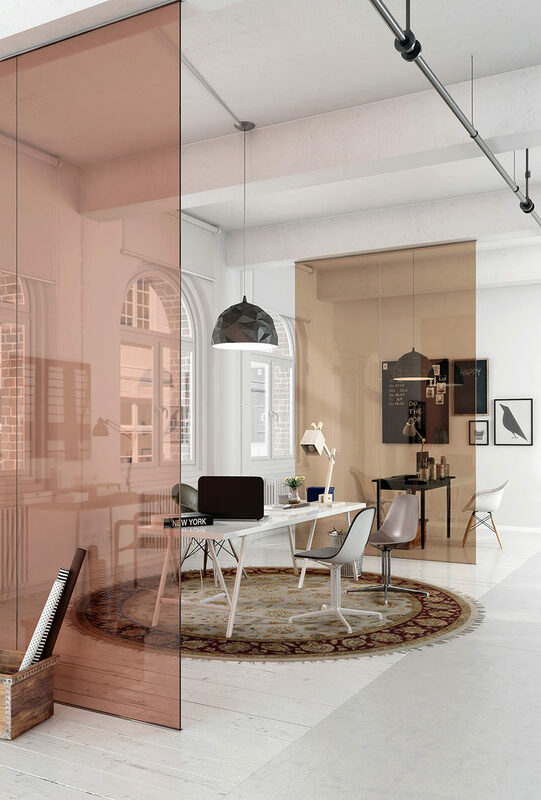 Colored glass is a great way to split up a space without closing it off. 12. Suspended ropes give diners at this restaurant a sense of privacy while they eat. Designed by YOD Design Lab. Photos by Andrey Avdeenko. 13. A wood panel wall separates the tub from the bed in one of Canada’s greenest homes. Designed by Naikoon Contracting and Kerschbaumer Design. Photos by Ema Peter Photography. 14. A wall of geometric shapes divide the entry way and kitchen in this apartment. Designed by GAO Architects. Photography by Miran Kambic. 15. 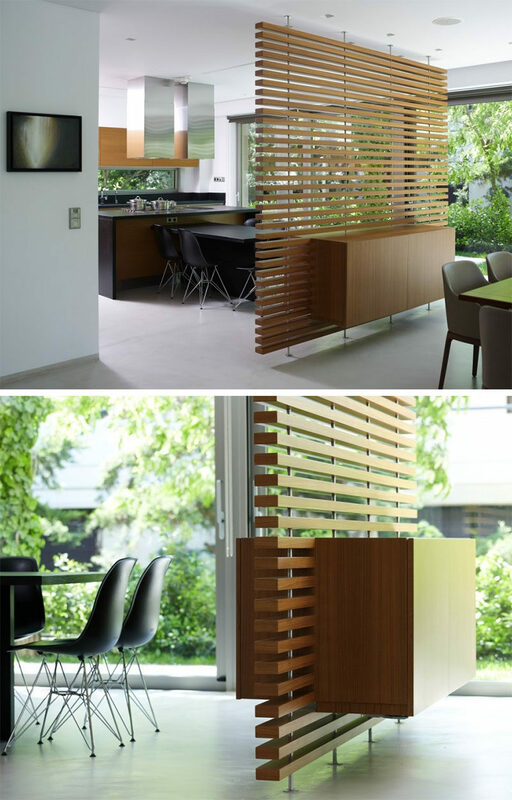 This slatted wooden room divider has a built-in cabinet. Designed by N. Koukourakis & Associates. Photography by Vaggelis Paterakis.